What is Nature's Recipe Adult Lamb Meal & Rice Dry Dog Food? Nature's Recipe Adult Lamb Meal & Rice Dog Food is part of the life stages line of foods specifically tailored to your dog's life stage. This formula uses lamb meal as a single protein source and oatmeal and rice as carbohydrate sources to maintain muscle strength and energy levels for active adult dogs. As dogs grows out of the puppy stage, so should their diet. 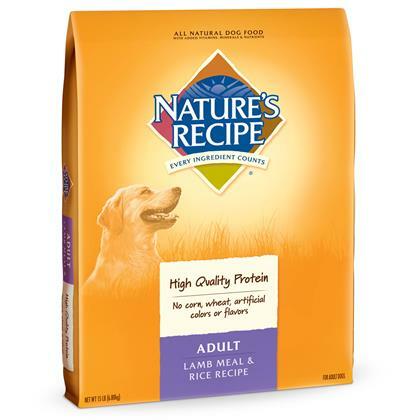 Nature's Recipe Adult Dog Food is formulated to maintain your dog's muscle health, metabolism and alertness. Ingredients: Lamb Meal, Barley, Oatmeal, Ground Rice, Poultry Fat (Preserved with Mixed Tocopherols), Natural Flavor, Tomato Pomace, Sodium Tripolyphosphate, Flaxseed, Potassium Chloride, Vitamins (Vitamin E Supplement, L-Ascorbyl-2-Polyphosphate [Source of Vitamin C], Inositol, Niacin Supplement, Vitamin A Supplement, D-Calcium Pantothenate, Thiamine Mononitrate, Beta-carotene, Riboflavin Supplement, Pyridoxine Hydrochloride, Menadione Sodium Bisulfite Complex, Vitamin D3 Supplement, Folic Acid, Biotin, Vitamin B12 Supplement), Minerals (Zinc Proteinate, Ferrous Sulfate, Zinc Oxide, Iron Proteinate, Copper Sulfate, Copper Proteinate, Manganese Proteinate, Manganous Oxide, Calcium Iodate, Sodium Selenite), Taurine, Lactic Acid, Choline Chloride, Yucca Schidigera Extract, Citric Acid (Used as a Preservative), Rosemary Extract.